A plate of crispy French fries topped with tomato sauce may be a lip-smacking treat for you but unhealthy and harmful to your cat. 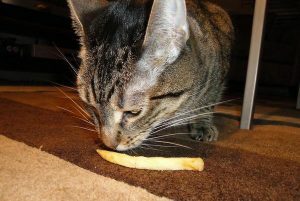 It is not a good option to provide your cat with French fries even as an occasional treat as its high calorie and salt content would be harmful to it. A small serving of French Fries has about 134.2-milligrams sodium, much higher than the amount cats need on a daily basis (approximately 21 milligrams). Excessive sodium in cats may lead to a lot of health hazards including sodium poisoning in extreme cases. Since they are deep fried, they have are low in essential fatty acids and high in saturated fats, thus adding on to the extra calories in a cat’s body, even resulting in obesity. Apart from the fries, the dips and sauces used to eat them are equally harmful since they contain onion garlic as well as other additives that might prove toxic to cats. If your cat experiences discomfort after munching onto a single piece of French fry contact a veterinarian at once or call the ASPCA Animal Poison Control Center Helpline at (1-888-426-4435).